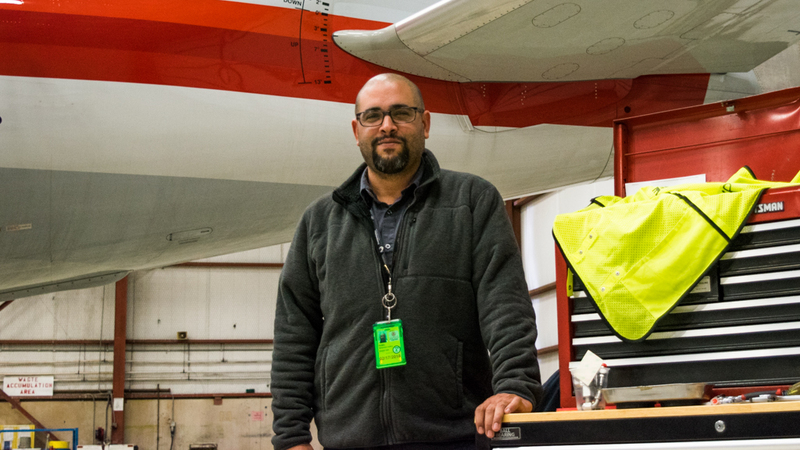 As an Envoy Mechanic, Raibel Manzano says he enjoys working on the line at Dallas-Fort Worth International Airport (DFW) because “every day is something different.” It’s kind of like Forrest Gump’s box of chocolates – if that box were an 82-thousand lb. aircraft. Actually, Raibel loves working on the line so much he says he wants to stay out in the field as long as he can. The 37-year-old mechanic from San Juan, Puerto Rico says it will be almost 10 more years until he will submit to a manager’s job behind a computer. But this doesn’t mean that Raibel shies away from responsibility. In fact, it’s the exact opposite. For several years now, Raibel has been tasked with “training the trainers” in all matters of aircraft maintenance. At Envoy’s newest maintenance base in Little Rock, Ark., he spent long hours and months instructing mechanics on maintenance of the Embraer 175 (E175). Not only was he doing the hands-on work, he filled out paperwork and structured daily duties as crew chief. It’s a small price to pay to do what he loves most, teaching others what he’s learned. In high school, Raibel dreamed of fixing cars and other machines. He’s always had a curiosity for how things work, and would take apart and try to fix electronics and other machines around his house. His first job, however, wasn’t as a mechanic. 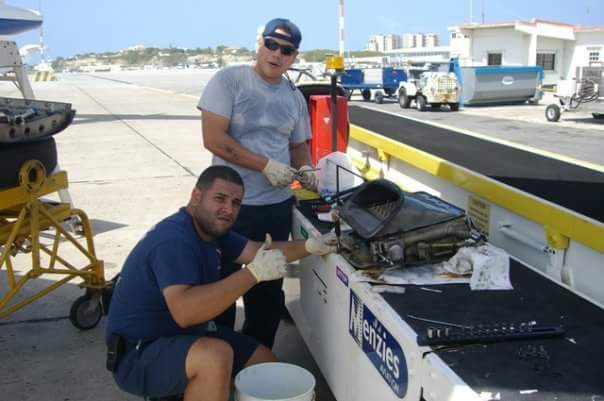 He started out as an aircraft cabin cleaner for a company subcontracted by American Eagle (now Envoy) in San Juan. 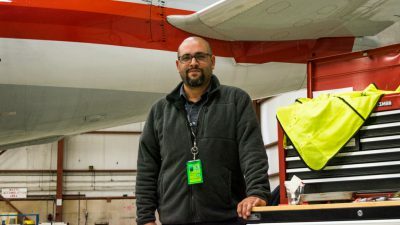 While on duty, he was noticed by a maintenance crew chief for his work ethic, and asked if Raibel wanted to help some of the mechanics working at the hangar. At first, he was asked to work on small tasks like performing paint touch-ups on aircraft interiors, and eventually graduated to assisting with tire changes and some heavy maintenance duties. 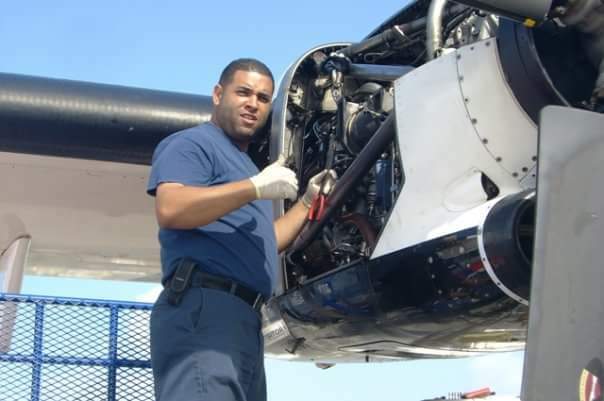 In 2001, Raibel earned enough hours of experience to earn his A&P license to become an Aircraft Maintenance Technician. He worked for eight years in San Juan as mechanic, inspector and crew chief. Eventually, Raibel relocated to DFW in 2010. With his wife and three children, he packed up and embarked on what would be a fruitful journey. Yet, at first, there was the inevitable language barrier he and his colleagues must break down, or, in Raibel’s case, work around. He says that even though he had difficulty communicating in English, he found he could speak Mechanic with ease. 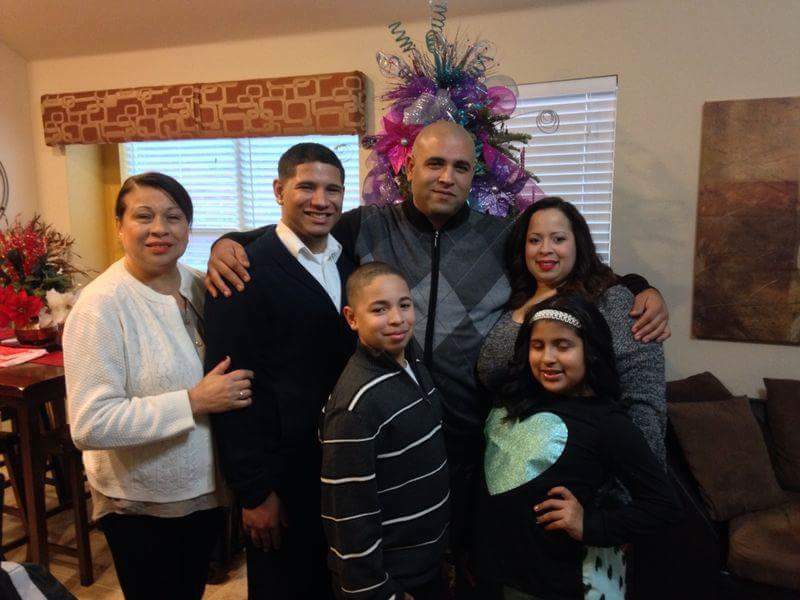 After seven years at DFW, Raibel has found a niche of teacher and trainer. He’s comfortable in the U.S. now and frequently ventures out on trips with his family. When asked about his hobbies, he said that he doesn’t really have any because he does what he loves on the job. At home, he’s happy to spend time with his wife and children. In the DFW hangar, where Raibel is stationed when he’s not working on the line, an E175 is parked awaiting maintenance. Raibel mentions that he likes working on the new computerized aircrafts, but loved working on the ATRs and Short 360s the most. Raibel would know, because he’s run the gamut of aircraft maintenance, special training and contributes as an instructor. Still, he wouldn’t want to be anywhere else but out in the field.